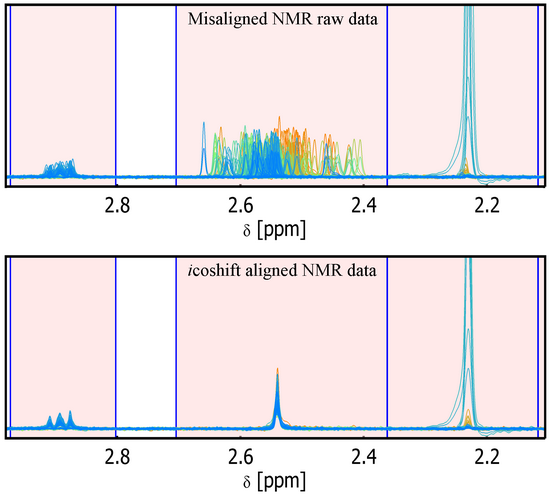 The icoshift tool for Matlab presented here is an open source and highly efficient program specifically designed for solving signal alignment problems in metabonomic NMR data analysis, but it can also properly deal with other spectra-like datasets (e.g. data from other spectroscopic methods or chromatographic data). The icoshift algorithm is based on COrrelation SHIFTing of spectral Intervals and employs an FFT engine that aligns all spectra simultaneously. The algorithm is demonstrated to be faster than similar methods found in the literature making full-resolution alignment of large datasets feasible and thus avoiding down-sampling steps such as binning. The algorithm can use missing values (NaN) as a filling alternative in order to avoid spectral artifacts at the segment boundaries. An exhaustive help is provided along with the algorithm as well as a demo working on a real NMR dataset. V1.2 introduces 'average2' as a new automatic target for the alignment process. Often the mean spectrum/chromatogram is not nicely shaped for a good alignment but can slightly improve it in a way that a subsequent mean target, obtained from the roughly aligned matrix, can be a more efficient reference for aligning the raw data matrix. Furthermore the user is asked a value to be used as a multiplier for enhancing the calculated target for a better visual inspection of its shape. V 1.2 - 03 July 2012: Introducing the 'average2' xT (target) for a better automatic target definition.